We all have bedrooms but not all of us have the right color for them. Come take a look at some options you may not have thought of to change that mood around! Who says you can’t put red in the bedroom? Lol, well I’m pretty sure I did but just because I said it doesn’t mean you shouldn’t rule it out. After all, red is not a very relaxing color as they say right? 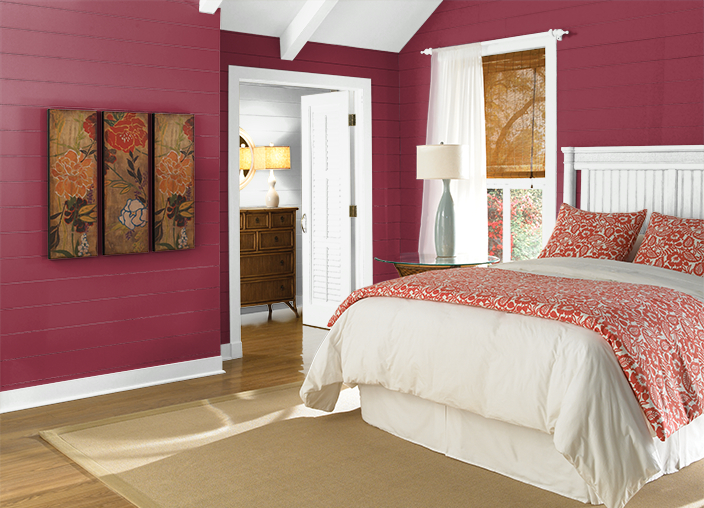 Red is also not a very popular choice or the bedroom because it’s not the typical “soothing or calming” color choice. Having said that, this color is a little more on the playful, purple side which would be perfect for the young girl or teen in the house. It’s a fun, youthful hue and looks popping next to a crisp white trim. Go for the ultimate in fun and pair it with snaps of orange or coral. Believe it or not, this is considered an “edgy” hue. It’s on the cusp between beige and gold which are two very dangerous colors to consider at this time. Did I just say “dangerous”? Yes that was a little dramatic but you should see the faces of my clients when I even mention a color that is even remotely close to gold. Which is a shame because just because it’s some type of gold, doesn’t mean you should rule it out. Gold happens to be one of the colors that I highly recommend as a “feel good, Holistic hue for the home”. I had it in my Pittsburgh home and currently also have some type of gold shade in my bedroom. Can’t be all that bad it I like it 🙂 What I’m saying is don’t be frightened by the name of a color, be more concerned about how it makes the room feel. I know for a fact that this color will change up the energy in the bedroom for the better. Well folks here we have it! The blue bedroom. You’ve probably heard me say over and over again how I’m try to end the blue-gray trend and bring other color combos into the home. It’s not that I don’t like it, I mean come on – look how pretty this blue room looks right? It’s just that I’m trying to sway you into a different way of looking at color for your home especially bedroom color. We need to stop looking at the norms and start being a little more creative. Think of any of your two favorite colors and put them together. Think of ANY two color and put them together – just give color a chance. By the way, I love the darker slate gray I chose for the trim. Now that’s stirring up the color pot just a little to update a look that’s been around for a while. Not bad right? Yes we are back in the 80’s with peach and sea foam and folks, it looks good! I love peach to pieces, always did and always will. There is just so much you can combine with this color to man it up or keep it feminine. 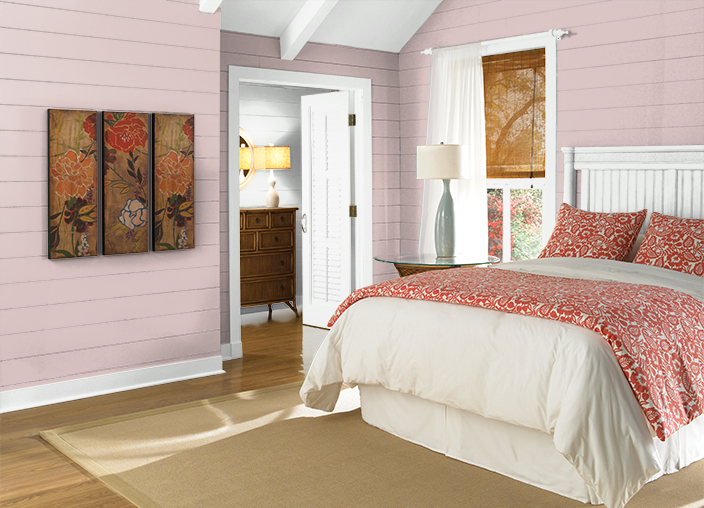 Peach is fresh, relaxing and just a dreamy color for the bedroom. The energy will shift in this room as it softly swirls around and around the room. Peach is delicate so it will just cradle and contain that softness it invokes as it pushes that feeling right out back into the room. I lived with this color back in the day for years and I can tell you first hand – this color has great energy and is perfect for the bedroom. Show me the brown! Here I’m showing you a bedroom that has a brown accent wall. Now this is interesting because I also have a brown accent wall in my house. It’s grounding, strong and is EXTREMELY cozy at night. I paired the brown up with a light neutral that has a slight green undertone – interesting combo right? Did you see the trim I used? Super cool isn’t it? Let start putting away the white trim and replace it with color. Look how neat the is room looks! Brown is an earthy color that has great connection to your spirit – meaning the nuts and bolts of the YOU. That is why it’s so abundant in Nature. It’s strong, yet not harsh like black is. It’s both male and female which makes it ideal for the master bedroom and more importantly, since it’s such a great color for “connecting” is really good for the bedroom (wink-wink). Just like a sunrise. As the sun starts to rise you get a glimpse of the newest pink that day has seen. It’s soft and barely there. It’s like a whisper. Pink is the most amazing color for a bedroom but unfortunately most men won’t go for this really girly color. Too bad guys! How can I explain the energy of pink? Let’s see, pink is like a Mom holding a baby’s hand, like a butterfly landing on a child’s fingertip, like dipping your feet into a stream just one toe at a time. Get the picture? Pink is a sensual feeling that slowly tickles your senses every time you look at it. That’s pink. I have a pink office and yea, it feels really good. Now this light lilac is similar to pink as far as energy. Here, I want to talk more so about the room instead of the color. See all the crazy angles in this room? Whenever I see a room like this, I love to paint it all one color and make those crazy lines just disappear. Now you don’t have to worry about where to start and stop the color or cutting in. Just paint away and enjoy. Well this was super fun to write about. Isn’t it nice when I have pictures of the rooms so you can really see how the color will look? Thanks to Behr paint for providing these rooms capes and thanks to you all for reading this short novel on how color changes the flow of a bedroom. Cool stuff right? Enjoyable and interesting blog entry. I just decorated a small bedroom for myself and I wanted it all white and some blue, I am a minimalist. Almost finished, quite pleased. I realise how important colour is in our daily lives, and enjoy it immensely. 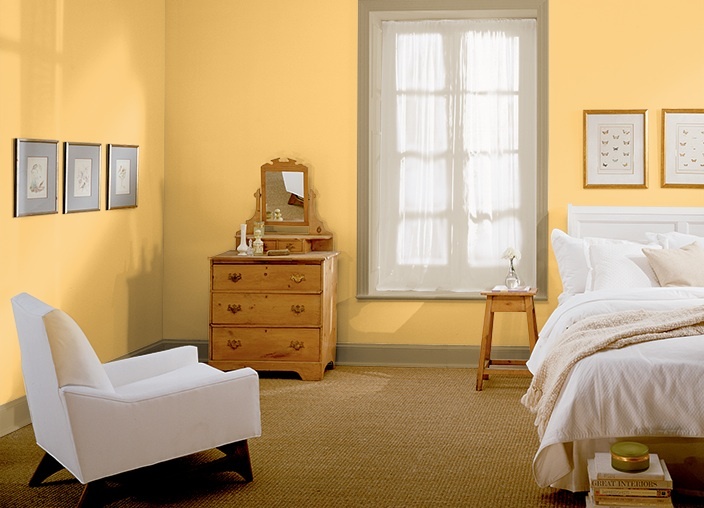 and it’s so important to choose the colors that we like – no matter what they are – in our home, especially the bedroom. Sounds pretty!